Cervical esophageal cancer (CEC) is uncommon, accounting for less than 5% of all esophageal cancers. The management of CEC is controversial. This study investigated treatment outcomes and prognostic factors of survival in CEC patients undergoing definitive radiotherapy or concurrent chemoradiotherapy (CCRT). Ninety-one CEC patients were treated by intensity-modulated radiation therapy (IMRT) and three-dimensional conformal radiation therapy (3DCRT) between July 2007 and September 2017. The mean prescription dose was 64 Gy (range 54-70 Gy) delivered as 1.8-2.2 Gy per fraction per day, 5 days a week. Out of 91 patients, 34 received concurrent cisplatin-based chemotherapy (CT) including 18 patients who also received neoadjuvant CT. 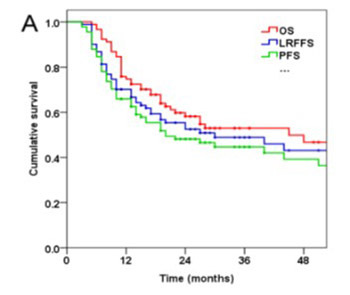 Overall survival (OS), locoregional failure-free survival (LRFFS), and progression-free survival (PFS) were estimated by the Kaplan–Meier method. Prognostic factors of survival were determined in univariate (log-rank test) and multivariate (Cox proportional hazard model) analysis. Treatment-related toxicity was also assessed. Median follow-up time for all patients was 19 months. Two-year OS, LRFFS and PFS of all patients were 58.2%, 52.5% and 48.1%, respectively. Clinical stage was an independent prognostic factor for OS (HR = 2.35, 95% CI: 1.03-5.37, p = 0.042), LRFFS (HR = 3.84, 95% CI: 1.38-10.69, p = 0.011), and PFS (HR = 2.68, 95% CI: 1.11-6.45, p = 0.028). Hoarseness was an independent prognostic factor for OS (HR = 2.10, 95% CI: 1.05-4.19, p = 0.036). CCRT was independently associated with better LRFFS (HR = 0.33, 95% CI: 0.14-0.79, p = 0.012). 3DCRT and IMRT with concurrent CT is well-tolerated and may improve local tumor control in CEC patients. Advanced clinical stage and hoarseness are adverse prognostic factors for OS, LRFFS, and PFS in CEC. Mendenhall WM, Sombeck MD, Parsons JT, Kasper ME, Stringer SP, Vogel SB. Management of Cervical Esophageal Carcinoma. Semin Radiat Oncol 1994; 4(3):179-191. Ferahkose Z, Bedirli A, Kerem M, Azili C, Sozuer EM, Akin M. Comparison of free jejunal graft with gastric pull-up reconstruction after resection of hypopharyngeal and cervical esophageal carcinoma. Dis Esophagus 2008; 21(4):340-345. Ma JB, Song YP, Yu JM, Zhou W, Cheng EC, Zhang XQ, et al. Feasibility of involved-field conformal radiotherapy for cervical and upper-thoracic esophageal cancer. Onkologie 2011; 34(11):599-604. Cao C, Luo J, Gao L, Xu G, Yi J, Huang X, et al. Definitive radiotherapy for cervical esophageal cancer. Head Neck 2015; 37(2):151-155. Gkika E, Gauler T, Eberhardt W, Stahl M, Stuschke M, Pottgen C. Long-term results of definitive radiochemotherapy in locally advanced cancers of the cervical esophagus. Dis Esophagus 2014; 27(7):678-684. Miyata H, Yamasaki M, Takahashi T, Kurokawa Y, Nakajima K, Takiguchi S, et al. Larynx-preserving limited resection and free jejunal graft for carcinoma of the cervical esophagus. World J Surg 2013; 37(3):551-557. Chou SH, Li HP, Lee JY, Huang MF, Lee CH, Lee KW. Radical resection or chemoradiotherapy for cervical esophageal cancer? World J Surg 2010; 34(8):1832-1839.
Cooper JS, Guo MD, Herskovic A, Macdonald JS, Martenson JA, Jr., Al-Sarraf M, et al. Chemoradiotherapy of locally advanced esophageal cancer: long-term follow-up of a prospective randomized trial (RTOG 85-01). Radiation Therapy Oncology Group. Jama 1999; 281(17):1623-1627. Adelstein DJ. An Intergroup Phase III Comparison of Standard Radiation Therapy and Two Schedules of Concurrent Chemoradiotherapy in Patients With Unresectable Squamous Cell Head and Neck Cancer. Journal of Clinical Oncology 2003; 21(1):92-98. Bonner JA, Harari PM, Giralt J, Azarnia N, Shin DM, Cohen RB, et al. Radiotherapy plus cetuximab for squamous-cell carcinoma of the head and neck. N Engl J Med 2006; 354(6):567-578. Fenkell L, Kaminsky I, Breen S, Huang S, Van Prooijen M, Ringash J. Dosimetric comparison of IMRT vs. 3D conformal radiotherapy in the treatment of cancer of the cervical esophagus. Radiother Oncol 2008; 89(3):287-291. Freilich J, Hoffe SE, Almhanna K, Dinwoodie W, Yue B, Fulp W, et al. Comparative outcomes for three-dimensional conformal versus intensity-modulated radiation therapy for esophageal cancer. Dis Esophagus 2015; 28(4):352-357. Ma P, Wang X, Xu Y, Dai J, Wang L. Applying the technique of volume-modulated arc radiotherapy to upper esophageal carcinoma. J Appl Clin Med Phys 2014; 15(3):4732. Wu Z, Xie C, Hu M, Han C, Yi J, Zhou Y, et al. Dosimetric benefits of IMRT and VMAT in the treatment of middle thoracic esophageal cancer: is the conformal radiotherapy still an alternative option? J Appl Clin Med Phys 2014; 15(3):4641. Zhang WZ, Zhai TT, Lu JY, Chen JZ, Chen ZJ, Li DR, et al. Volumetric Modulated Arc Therapy vs. c-IMRT for the Treatment of Upper Thoracic Esophageal Cancer. PLoS One 2015; 10(3):e0121385. Zhang P, Xi M, Zhao L, Qiu B, Liu H, Hu YH, et al. Clinical efficacy and failure pattern in patients with cervical esophageal cancer treated with definitive chemoradiotherapy. Radiother Oncol 2015; 116(2):257-261. Huang SH, Lockwood G, Brierley J, Cummings B, Kim J, Wong R, et al. Effect of concurrent high-dose cisplatin chemotherapy and conformal radiotherapy on cervical esophageal cancer survival. Int J Radiat Oncol Biol Phys 2008; 71(3):735-740. Stuschke M, Stahl M, Wilke H, Walz MK, Oldenburg AR, Stuben G, et al. Induction chemotherapy followed by concurrent chemotherapy and high-dose radiotherapy for locally advanced squamous cell carcinoma of the cervical oesophagus. Oncology 1999; 57(2):99-105. Suzuki G, Yamazaki H, Ogo E, Abe T, Eto H, Muraki K, et al. Multimodal approach for cervical esophageal carcinoma: role of neoadjuvant chemotherapy. Anticancer Res 2014; 34(4):1989-1992. Tong DK, Law S, Kwong DL, Wei WI, Ng RW, Wong KH. Current management of cervical esophageal cancer. World J Surg 2011; 35(3):600-607. Kadota H, Sakuraba M, Kimata Y, Hayashi R, Ebihara S, Kato H. Larynx-preserving esophagectomy and jejunal transfer for cervical esophageal carcinoma. Laryngoscope 2009; 119(7):1274-1280. Ott K, Lordick F, Molls M, Bartels H, Biemer E, Siewert JR. Limited resection and free jejunal graft interposition for squamous cell carcinoma of the cervical oesophagus. Br J Surg 2009; 96(3):258-266. Sun F, Li X, Lei D, Jin T, Liu D, Zhao H, et al. Surgical management of cervical esophageal carcinoma with larynx preservation and reconstruction. Int J Clin Exp Med 2014; 7(9):2771-2778. Cao CN, Luo JW, Gao L, Xu GZ, Yi JL, Huang XD, et al. Primary radiotherapy compared with primary surgery in cervical esophageal cancer. JAMA Otolaryngol Head Neck Surg 2014; 140(10):918-926. Liu SY, Chiu PW, Teoh AY, Yung MY, Lam CC, Wong SK, et al. Chemoradiotherapy or Pharyngo-Laryngo-Esophagectomy for Cervical Esophageal Squamous Cancer. Gastroenterology 2011; 140(5, Supplement 1):S-1033. Dudhat SB, Mistry RC, Fakih AR. Complications following gastric transposition after total laryngo-pharyngectomy. Eur J Surg Oncol 1999; 25(1):82-85. Lam KH, Wong J, Lim ST, Ong GB. Pharyngogastric anastomosis following pharyngolaryngoesophagectomy. Analysis of 157 cases. World J Surg 1981; 5(4):509-516. Triboulet JP, Mariette C, Chevalier D, Amrouni H. Surgical management of carcinoma of the hypopharynx and cervical esophagus: analysis of 209 cases. Arch Surg 2001; 136(10):1164-1170. Burri RJ, Lee NY. Concurrent chemotherapy and radiotherapy for head and neck cancer. Expert Rev Anticancer Ther 2009; 9(3):293-302. Tai P, Van Dyk J, Yu E, Battista J, Schmid M, Stitt L, et al. Radiation treatment for cervical esophagus: patterns of practice study in Canada, 1996. Int J Radiat Oncol Biol Phys 2000; 47(3):703-712. Uno T, Isobe K, Kawakami H, Ueno N, Shimada H, Matsubara H, et al. Concurrent chemoradiation for patients with squamous cell carcinoma of the cervical esophagus. Dis Esophagus 2007; 20(1):12-18. Yamada K, Murakami M, Okamoto Y, Okuno Y, Nakajima T, Kusumi F, et al. Treatment results of radiotherapy for carcinoma of the cervical esophagus. Acta Oncol 2006; 45(8):1120-1125. Cao CN, Luo JW, Gao L, Xu GZ, Yi JL, Huang XD, et al. Intensity-modulated radiotherapy for cervical esophageal squamous cell carcinoma: clinical outcomes and patterns of failure. Eur Arch Otorhinolaryngol 2016; 273(3):741-747. Kogo M, Watahiki M, Sunaga T, Kaneko K, Yoneyama K, Imawari M, et al. Analysis of the risk factors for myelosuppression after chemoradiotherapy involving 5-fluorouracil and platinum for patients with esophageal cancer. Hepatogastroenterology 2011; 58(107-108):802-808. Ludmir EB, Palta M, Wu Y, Willett CG, Czito BG. Definitive chemoradiation therapy for cervical esophageal carcinoma: a single-institution experience. Int J Radiat Oncol Biol Phys 2014; 90(1):S348. Burmeister BH, Dickie G, Smithers BM, Hodge R, Morton K. Thirty-four patients with carcinoma of the cervical esophagus treated with chemoradiation therapy. Arch Otolaryngol Head Neck Surg 2000; 126(2):205-208.